I wake up early at 5am in day 5, when others are still in their dream. Next to the Nepenthes Camp is an observation platform on top of a 33-Meter Agathis borneensis tree. I want to climb up there early to see the sunrise. Soon Mr. J and Mr. T also wake up to join me. Ms. S doesn’t join coz she has issue with the height and says there is no way she will do it. It is already frightening just looking at this tall tree. Anyway, adventure is doing something that scares you. At 5:15am, one by one, we climb up to the tree top with aluminum ladder that fixed to the tree body. Imagine you climb a ladder to the top of a building over 10 floors high in the dark (about same height as the Karamunsing Complex in Kota Kinabalu). This is the second scariest climb that I attempt so far (the first is Batu Punggul). A misstep and you will be a free falling object for hundred feet. One good thing to climb in the dark is, you can’t see anything under your feet, so it is not that terrifying. Mr. T and J got up there first. I hang the camera and tripod over my shoulder and move up carefully. After a few days of holding camera to take thousand of photos, my fingers are really painful. The extra camera weight also makes my legs tired and shivers. I have to stop a few times to rest. Finally, I reach the top within 10 minutes. Above: Nepenthes Camp looks so small from top. You can see the solar panel on the roof. Strictly speaking, the observation tower is only a wooden platform on top of a tall tree. It is not really a tower. The structure is fenced and solid enough to take 5 to 6 persons. It is 5:40am. We look out from this platform and see that our house is so small under our feet. We also admire and appreciate the pretty Agathis borneensis tree that house the structure. Above: the beautiful skin of Agathis borneensis tree, note the pocked-marked, greyish-reddish bark. The sunrise comes at 6:10am. The surrounding and the trees are painted with golden hue of colors. The birds also start their days. Many colourful birds such as Iora and Scarlet Minivet gather around the canopy of this tree. This platform is quite a nice bird watching spot. We climb down at 6:40am for breakfast, when the sunrise show is over. Damn it! I find a crack on the LCD protector. Luckily it helps to block the damage to LCD which would cost hundreds to fix. We are very relaxing today, coz we will leave the total wilderness of Maliau Basin and the trail is mostly descending (easy) path. Even though I am cut off from civilisation for many days, I don’t really feel homesick, it’s a sad day for me actually. After we have our breakfast, we depart at 8:30am to Agathis Camp, which is 7.5 KM away and a move from 1,005 to 421 Meters above sea level. Over the days, I discover a special ability of women. They just can’t stop talking, during trekking, eating and sleeping, ALL the time. I am already out of breath trekking and they still talk to me. At the end, I just pretend I don’t hear them. Sorry, I am just too tired. Above: lookout point, where you can see Maliau rim through gap between the trees. Since this is the last jungle trekking of our trip, we just walk slowly, open all our senses and enjoy the surrounding view. We saw a family of 3 Bornean gibbons swings on tree branches. Red & Hose’s Leaf Monkeys (langurs) and Bornean gibbons are very common primates in Maliau. We also hear the distinct calls of Black & Yellow Broadbill and Bornean Bristlehead, and also the loud pecking noise of a woodpecker. Then Mr. T is very excited and shows me a flower of Dendrobium cinnabarinum. He says this flower is very rare, the two (all) varieties are found in Maliau Basin only. Above: flower of Dendrobium cinnabarinum. Finally at 12:30pm, we arrive Agathis Camp, where we have our pack-lunch. We are asked to take a shower and put on clean clothing, before we are allowed to sit in the beloved 4-wheel of the guide. Then we leave Agathis Camp and go to the hostel of MBSC, where we will spend the last night in Maliau Basin. After staying 3 days in jungle camp, the hostel is really a 5-star accommodation to us now. The guides and porters are very happy too coz now they can watch World Cup 2010 in MBSC. You are wrong if you think we are holidayers who can sit still for day doing nothing. After we unpack our bags in hostel, we start to get restless and want to go to Skybridge (suspension bridges built between tall trees high above the ground). It rains heavily in the afternoon so we go around 4PM. The Skybridge is only a 10-minute drive from MBSC. Constructed in April 2007 and linked up with about 8 super tall trees (Uratmata, Sepatir, Merbau and Seraya), Skybridge is the second longest canopy walk of Sabah, with a length of 293.8 Meters (Highest Point: 21.35 Meters). Maliau Basin is an Important Birding Area. More than 290 bird species are found here, with more than 20 are endemic to Borneo, and 26% are listed as threaten or near-threaten by IUCN. 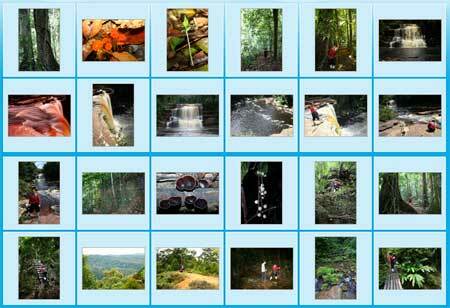 Here you can find all 8 species of hornbill of Borneo, 6 species of kingfishers and all 9 species of Bornean barbets. We see fruits of fig species (Ficus), which is the favourite of hornbills, who visit as many as 240 species of fruit trees. We spend an hour here and back to hostel later. Tonight we have a night safari at 8pm. We just sit on the jeep and let the guide scans for wildlife by using a spotlight. If the guide spots anything, the car will stop and he will show and tell us what we see. This is highly depends on luck. In bad day, you would see nothing. Above: this wild boar (Sus barbatus) always comes to MBSC. She got 8 babies. During an hour of fun drive, we see Malay Civet cat, Sambar Deer (cervus unicolor), Flying Squirrel, Rhinoceros Hornbill and Buffy Fish Owl. We have been seeing the fresh dung of Banteng and elephants and hope to see them tonight, but too bad none of them turn up. Anyway, below are their photos for you to know how they look like. Above: Banteng (Bos javanicus), Asian Wild Cattle or Bornean Wild Ox, known as Tembadau locally. Left is the female and right is male Banteng. Banteng is extinct in West Malaysia (since 1950) and Sarawak (since 1980). It was used to be the favourite game species of hunters but now it is endangered and protected in Sabah. The domesticated Banteng becomes Bali cattle. Note the white “stockings” on the legs. About 15 to 20 Banteng are recorded in Maliau. Above: Pygmy elephant of Borneo is the smallest elephant species in the world. Above: Common barking deer (Red Muntjac), known as Kijang locally. It can grow in length up to 98 to 111 cm, a height of 50 cm and a weight of 15 to 35 Kg. You can buy its meat as it is still the game species. FYI, all 5 cat species (i.e. flat-headed cat, marbled cat, bay cat, leopard cat, clouded leopard) of Sabah are found around Maliau Basin. They are very elusive and secretive animals active at night, so they are very hard to spot. Finally, we have joined all the programme In Maliau Basin and will go back to Kota Kinabalu tomorrow. But there is still one more unplanned programme waits for us tomorrow.